As soon as this little treasure arrived we all went goo goo for it. The intricate detailing, the dainty handles, the rich golden color! Even the package it comes in is pretty. This is THE most fabulous set we have seen in a long time and we wanted to share it with all of you. We hope you are drooling as much as we were. and I think I hear your Stocking calling for one too! Oh, Santa, I would feel like a Princess with this lovely set! The scissors in this set remind me of a vintage pair I bought in Europe in 2008! I’d love to own such a fine pair- beautiful and practical at the same time- perfect! This set would be a welcome addition to my morning quilting sessions. Thanks for the chance! This is absolutely gorgeous, would love if I got it in my stocking! That is amazing! Truly elegant…just like my friend , whom I would pass this beauty on to. Thanks for the chance! I love these elegant scissors! What a thrill it would be to win these. Santa should give this cute little gift to me because I will gift it to a special sewer in my life who would really love it. It is so pretty, and it would sure look pretty in my stocking, I could put that to good use Thank You Moda! well I can’t think of any quilter who wouldn’t love this beautiful set. Thank you for offering a lovely giveaway. A gift that’s pretty AND useful, that’s my kind of gift. It would be wonderful to win these and have lovely things to use in my sewing room! Thanks for the chance. That is a beautiful set. Would make a nice gift. Dear Santa, this adorable scissor set would look lovely in my stocking. Please pick me! Oh Santa! This is a beautiful gift that I would love to receive! Thank you for the giveaway. I think the wise Santa should leave this treasure in my stocking because it is simply delightful and would be treasured and well used. hanks for the chance. I’m following via email. I really need a new pair of embroidery scissors! OH Santa, please leave this in my stocking, it is so beautiful and would be a great addition to my sewing and quilting. Thanks for the opportunity to win. I have a Vintage Sewing Machine much like the one shown with this Victorian Scissor Set. How special it would be to have the Klasse’ Gift Set to display and use with the Old Singer. Both will someday be passed along to my Granddaughter so she can sit and sew and think of her ‘Quilting Nana’ and ‘Quilting Sisters’ from years ago. I am a hand quilter, hand appliquer and also a sometimes hand piecer this treasure would follow me like my favorite quilt. I hope to be eligable since I have been a very good quilter all year long. I am a follower. Since Santa knows I do both machine and hand work, he knows how handy this set would be for me. Please Mr. Santa, bring me some stitchin’ joy! Oooh! Santa these beautiful sewing assessories need to be used while sewing on my 1947 Featherweight, they’d feel right at home. I promise I’ll be gentle and treat them well and keep them safe like treasured my Granma’s buttons. What a pretty treasure to fin in my stocking Christmas morning. I would put it to good use. It would be great to have some quality tools! Thanks for the chance. These are so beautiful and I don’t have anything like it. They would be a great gift to have for Christmas. What a beautiful set! I’d love for Santa to put this is my stocking—I’m always loosing my thimble and scissors. Thank you for the chance to win! Santa Baby…I really could use a nice new pair of scissors and these are so lovely, please leave them for me! Santa says that I have been a very good girl this year and my Christmas stocking is calling my name to have this beautiful package with a pair of 3.5″ Italian Embroidery Scissors, a Golden Metal Thimble and a 60″ retractable Fiberglass Tape Measure with magnetic back to be delivered on Christmas morning. Thank you Moda for giving all of us a chance to win. because it is so beautiful! I would like Santa to leave these gorgeous set for me because I have been really nice this year. I have been a very, very good girl – please, oh please can I have this in my stocking? Thanks. Oh, Santa knows I have a “thing” for hand sewing accessories and these ones are certainly beautiful:) The case on the measure tape is absolutely over the top. I’d even put out some cookies Santa! I think Santa should leave this beautiful victorian set for me because I have been really good this year and I don’t have anything like it for doing my hand work,something I do most every day. This reminds me of my Granny! I got all my sewing, knitting and quilting gifting from her! If I won this I’d be able to remember her everytime I used it… love, love, love it. I would love to get this in my stocking! I have a thing about little scissors and would love this for my collection! This would make a wonderful gift for a gal pal of mine! Love the antique look of this pretty set! Ooooh! I’d love this. My spinning kit with all my tools was stolen and I still haven’t replaced my scissors. That would be perfect! That set is almost too pretty to use….but I’d manage to break them in gently…after my drooling subsides, of course! Oh what beautiful pieces to add to a quilters Chatelaine. Imagine the beauty hanging around your neck, just waiting patiently nearby to be used in creating your masterpiece. I would love to find these in my stocking. I would give them to my granddaughter who is just getting started. She would feel like a princess with these! It’s beautiful. Who wouldn’t love a pair of scissors that pretty? So beautiful! This would make anybody (even me) look like they really know what their doing! Oh Santa I have tried to be good this year and my White Treadle has been so helpful and would love to have a Klasse little scissor that matches her work with her. A special thank you to Klass for this sweet design and to Moda for spreading the word about it. I am posting this picture on my frig to make sure all the Santas in my life sees what I want in my socking. Sew pretty! Reminds me of my childhood Christmas at my great grandmother’s house where she had an old singer sewing machine with the foot pedal. I would love to receive this in my stocking. I’m making a stocking – just for these little lovely items. I love the vintage look of these goodies! Simply beautiful! This would make a perfect set, for making all the new clothes and emroideries for my first grandchild, due the first of January!!! Thanks for the opportunity. What a beautiful set! I love that it’s ready for travel. Oh this is a lovely stocking stuffer, I would swoon with delight! Thanks for the invite to play! Ooooh, scissors that scream “mom only” with out me having to tag or embellish my scissors. Just Lovely. This is so beautiful and I need new scissors! This embroidery set would be perfect for my travel sewing kit…and yes I’m drooling!! I would be super excited if I found this Victorian set in my stocking. It is sEw beautiful and definitely useful too!! Thanks for the chance…Happy holidays to all!! Wow, Santa would make my day with this in my stocking. Soooo elegant! I would love to have this Klasse Gift Set in my stocking! I am a hand stitcher this gift set is needed in my sewing bag that I take with me everywhere I go! Oh, how beautiful. Bella, Bella. I would love this set to keep close to me for all my quilting needs. Such a classic gift. Love it!! What a beautiful set! It is so much nicer to work with beautiful tools. Thanks for the chance to win! This is beautiful! Oh, I would love Santa to put this in my stocking. It would be so pretty to look at and it is useful at the same time. Wow1 It really is beautiful!! I would use it and enjoy it. It is nice to use beautiful sewing tools. I am a follower and if I should get this prize I should give it to a quilting friend who doesn´t have much stuff. I learned to sew back in high school when they still had home economics classes. I would love this vintage reminder of things past. Happy Holidays! My stocking is soooo lonely and empty!! Santa please fill it with these lovely scissors, thimble and tape measure!! I need/want some new scissors! It is so lovely! My stocking would love it and so would I! A magnetic ruler?!? I’d love to try that! I would Santa to leave me a quilt card to my local quilt show but I would also love those beautiful scissors! I would be the Queen of sewing with this set. Friday I am getting my final building inspection on my 1875 farmhouse renovation and my sewing room is all ready to begin my VERY FIRST quilt (vintage inspired, of course)… This would be an AMAZING addition to a space that will be doing LOTS of sewing over the next many years! Oh what beautiful things I could create with these beautiful tools at hand. 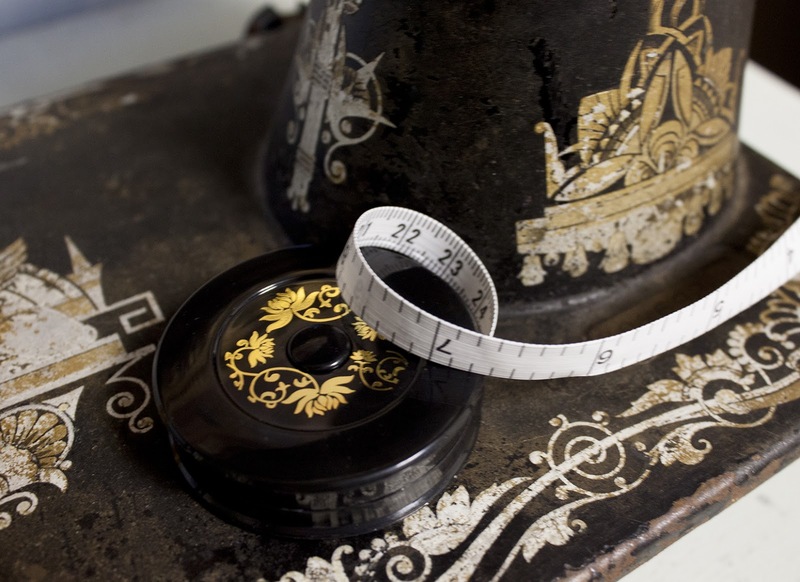 Italian Embroidery Scissors, A Golden Metal Thimble, and a Retractable Tape Measure, OH My…This reminds me of my grandmother, Such sweet memories. 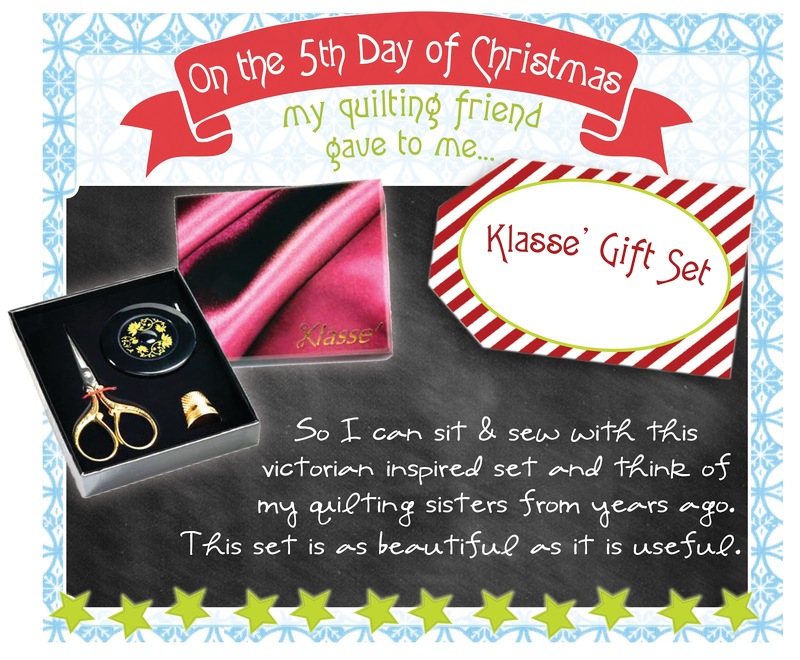 I have been a very good girl this year and would love this beautiful, useful Klasse gift set in my stocking. I would love to have such a beautiful set to use as I sew. So Beautiful. Reminds me of my Grandmother & her sewing basket. Thanks for sharing, and reminding me of Her. The delicate beauty of this set would grace any quilter’s home; for me it would bring joy as well. Simply lovely! I want santa to put these in my stocking because I don’t have little scissors and those are perfect and so pretty! Dear Santa, I really wanted the marking set, but if you are out of those, the klasse gift set looks pretty amazing, have a nice trip! What a gorgeous set! I want it left in my stocking to use it for needlework, handsewing, and cross stitching. You know, just put it in my lovely quilted Christmas stocking. Thank you! That is a beautiful set that would look great in my sewing room, he, he. Thanks for the opportunity to win such a nice accessory. So far my stocking is empty. :0( But, I love these…maybe…just maybe..I’ll get lucky & find them in my stocking! Santa , I have been so very good all year! These tools will keep my hands so busy and out of mischief next year. So please Santa don’t let me go down the idle hand path!!! What a really neat gift idea!! I would love to use these when working on my many bindings!!! What a beautiful set! It is the perfect little bundle to keep nearby for hand work. SANTA I DO NEED YOU TO LEAVE THIS DARLING LITTLE SEWING KIT IN MY STOCKING! THANK YOU! I do lots of handwork so this would be lovely. Thank you! Santa, would you please leave me a little something in my stocking! You can surprise me! This would make a PERFECT Christmas gift to my wonderful mother-in-law! She’d be thrilled to have it! This prize is beautiful and useful! (It’s farkle – functional + sparkle.) No other reasons needed. This is SO beautiful! I love tiny little scissors, and these are gorgeous. If Santa left this in my stocking, I’d be delighted! Would love to find this in my stocking because I love to do handwork. I am a life long cross stitcher. This should go to a cross stitcher. I know Santa would agree. Just because I need it…..
Love love love this set—Santa, please bring me this set—I’ve been very very good this year. Ohhh, just what I needs, I just saw some embroidery hoop art made with felt and this would be the perfect thing to help make those! I would love this in my stocking because I love beautiful things and it would look so pretty with my hand beaded needle holder! Thanks for the chance! I would love to have Santa leave this because I collect scissors…(or am I a horder)…Merry Christmas. I would love for Santa to slip this set into my stocking because those scissors are just gorgeous and would be a huge upgrade to my current pair. If I got this in my stocking, I would give it to my friend, who lost so much in Sandy. She loves embroidery. Oh how lovely! I do a lot of handwork and grab just any ol’ scissors~ I would love to have this beauty in my stitching tote. Thanks for the fun! Oh I just love this! The best ever! Lovely … and I love it if you choose me to be the winner of this sweet set! What a beautiful set! If Santa put it in my stocking, I know I’d want to do more hand sewing than I do now. Oh! This would go great with my new-found passion – English paper piecing!! Oh Santa, are you listening? I really, really, really want to see this in my stocking! It’s Gold and Black and from Moda… is there anything better? I need some new sweet scissors to leave by my chair in the living room. The tape measure would be treasured in my purse for when I find myself out shopping. 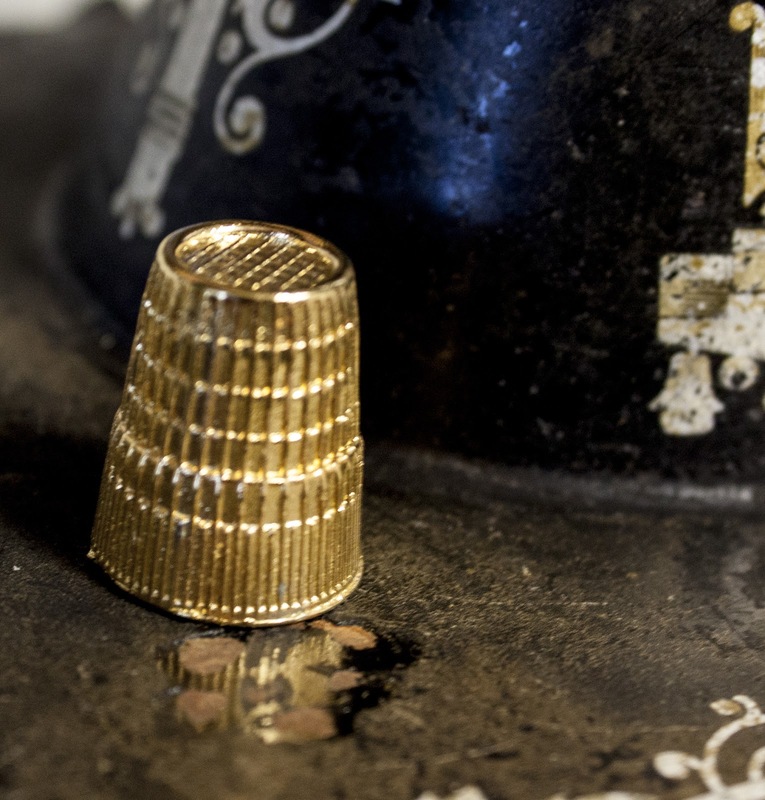 And a golden thimble.. well that would mean no more pricks and blood on my work. Oh please, please Santa, pick me! I am just getting back into Hand Embroidery and this this prize would be awesome to have. Also I love to quilt and everything would be a great addition to my tools. I would like this in my stocking because it is lovely and makes a stunning and thoughtful gift. And I would use it with my crazy quilting and my embroidery. Thank you for this chance to win. Pick me, pick me! This would be the perfect complement for the Singer Featherweight I am gifting this Christmas! This would be the perfect gift for my daughter-in-law, who travels and needs a small “kit” just like this, to sew-on-the-go! I would so love this in my stocking! My hubby would never think of it and I would LOVE it! thanks for the opportunity! Oh this would be a perfect addition to my collection of scissors!!! Such a beautiful set, Santa, please pick me!!! I would love for Santa to leave me this in my stocking because seeing those scissors reminds me of my mom. She had a little pair (not that pretty) that she would use all the time. I hope I get this in my stocking. I have been a good girl this year and done lots of sewing. Thanks, for the giveaway. Nancy P.
Now I am drooling and all ga-ga over this little set! How beautiful! Something to pass along to a granddaughter, too! I *NEED* this in my stocking, Santa!! I would love to give this to my mom for Christmas. What a perfect set! Oh so lovely! This would really make me to the queen of my sewing space,lol! Oh Santa! I have been very good and really need a new pair of pretty scissors and a new thimble too!! I will leave you some delicious cookies! Because I don’t have anything this pretty – I need it! What a great set and so luscious looking. I would like for leave this in my stocking because, “Hi, My name is Laura, and I am a Scissor Hoarder”. And these scissors are gorgeous!!! This set is beautiful and I would welcome the chance to add it to my sewing tools. So pretty!! I love sweet little things and finding this in my stocking would give me a huge smile. I’d love to find this in my stocking because my son used my good embroidery scissors to cut cardboard! I would love for Santa to put these in my stocking becuase I don’t have any little pair of scissors and my retractable tape measure just broke last night. Thank you for the chance to win. I do follow your blog. I would love Santa to put this in my Stocking since if would fit right in with my hand cranked sewing machine; (and this is my style) I do follow your blog. Because I’ve been such a GOOD Girl this year! I would love to have this set. 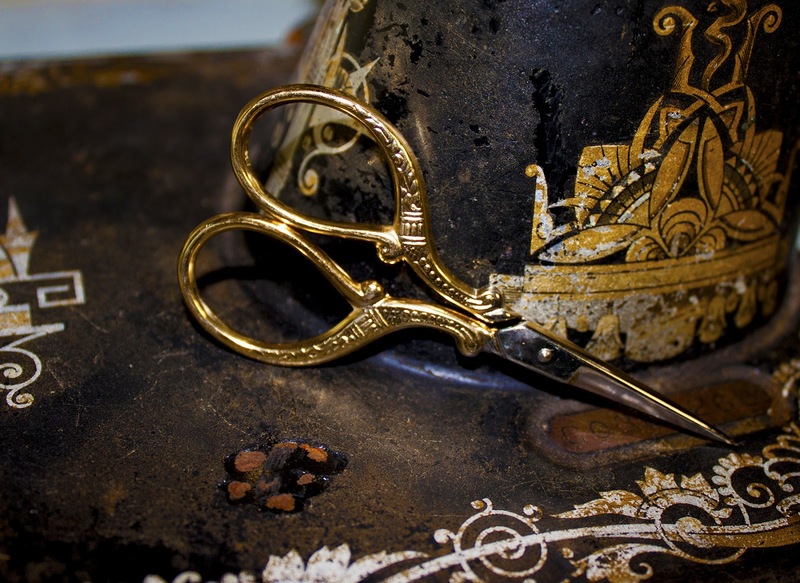 I adore everything vintage and a beautiful and sharp pair of scissors is essential to good sewn. Thank you for the contest and Merry Christmas. This is such a beautiful set — who wouldn’t love to have it? It would be nice for the ‘spectators’ to see what should really fill a girl’s stocking LoL. Thanks for the opportunity, and Merry 12 Days to you! 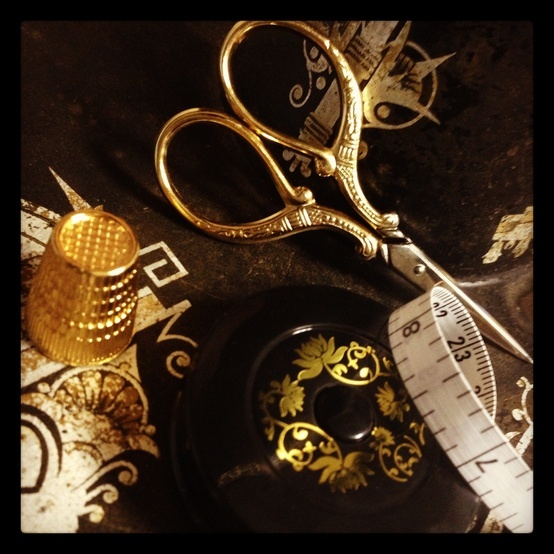 A Golden Thimble would have a place of honor on my table and I need some new scissors, especially gold ones. I have been very good this year. Santa should leave it for me because I don’t have cute little scissors or thimble in my sewing room. It is a sad little room but this prize would make it a happy place. That is so beautiful! I don’t have anything like that. Thanks for the chance! What a gorgeous set! I would be the envy of my quilting circle. This set would go in my special travel bag that goes everywhere with me. I love grabbing a stitch whenever I have a moment. Thank you! I love to embroider, whether it’s a complicated sampler, or a vintage dishtowel pattern on towel yardage. When I am working on a project, I feel really connected to my grandmothers, both of whom were immensely talented sewers and knitters….. I would love to find this in my stocking, because I can’t find it in Sweden and it’s beautiful. I love the little retractable tape measures I find here, but they are in centimeters and I ususally sew in inches. Also, I forgot I had my stork scissors in my carry on the last time I traveled, and I had to hand them over. These are Much prettier! What a lovely set and I would enjoy it so much if I found it in my stocking! I love this set – I want to win as it would make me so happy – it is calling out to me. Ohh this is so beautiful, I would love to have this “Klasse” little set. Thank you for this chance!!!!!! I would love to find this in my stocking on Christmas morning. What a delight! Such a beautiful set. Would love this Klasse’set in my stocking to dream of the hands that used sets like this every day in their lives, not just for craft, but necessity. This is a perfect set for on the go projects and hand sewing. I would love for Santa to leave in my stocking. This little set reminded me of my mother who could sew anything and who is long gone from my life. Although I am a ‘machine girl’, I have recently begun exploring hand piecing and quilting as I remember my Grandmother doing when I was a little girl. Sadly, all her handmade quilts are gone. But with my handwork, I hope to leave a special legacy to my children and grandchildren. To be able to use this beautiful Klasse set for snipping threads and sewing would add to the peace and serenity I feel as I hand quilt. Dear Santa, I would love to find the scissors, thimble, and measuring tape in my stocking this christmas. What a beautiful gift set! Santa needs to leave that in my stocking, right now it’s looking pretty empty! This is sew beautiful, who wouldn’t want Santa to bring them one? I’m always misplacing scissors, so it would be great to win another pair! What an exquisite sewing set. I would just love to find it in my stocking, its so pretty. Would love to see this set sitting on my quilt frame while I am hand quilting! This reminds me of my collection of antique sewing notions. But these would be usable. Sort of “have your antique scissors and use them too”! I have a great little scissor holder I want to make & need little scissors! What a nice set. I would love to have this set, just so I could look at it! It’s so beautiful. Thanks! I’d love to win this because (1) it’s beautiful, (2) I want to learn to hand sew & these would be useful, and (3) it’s beautiful. Worth repeating. Thanks for the giveaway. Ahhhh, SO beautiful! Please, let this end up in my stocking! This is almost too beautiful to use! I love it! I would love this elegant sewing set. It is stunning and yet practical. I would be the envy of my sewing bee friends……. What a lovely set! Please Santa, just because it is pretty. please santa, my stocking would be so empty without this beautiful set! I’ve been doing my part to boost the economy with beautiful Moda fabrics. Could you bring me these sewing notions please? Thanks. This set is beautiful! I would feel like I belonged to high society during the Victorian era using these. Oh Santa! I would feel like a queen with this beautiful set in my stocking! I wouldn’t need anything else in my stocking! I’ve recently gone back to English Paper Piecing and this sweet little set would be perfect to tuck into my sewing basket! I want santa put this on my xmas stocking because I cant find anything like this in my country. Santa this would be so lovely in my stocking! It would remind me so of my great-grandma and my grandma who’s footsteps I follow by quilting! I would love Santa to bring me this lovely sewing set. I love to embroider and this set would be so much fun to use. I want to go “goo goo” over that gorgeous set, too. I love elegant tools, although they do get lost in my creative mess. I would love it if Santa put this in my stocking… wouldn’t I be turning heads at our next quilting session if I pulled out these gorgeous tools to use! Oh My!!!! Because no matter how many scissors I buy I never can find the one I need for the purpose that I need it. I would LOVE to have this for embroidery and crossstitching. It’s gorgeous..even better than jewels! Lovely, lovely, lovely! Don’t know how you are parting with it, but since you are, I’d love to use these with my lovely fabrics. Thanks. Oh what a lovely set!! It reminds me of my Mom-Mom. I especially love the thimble. She always wore hers when sewing and I have it today in my sewing box. Santa I would love these beautiful scissors because….well because they are beautiful! This is such a lovely set of tools, and I think using these would improve my sewing/embroidery skills just by their shear elegance!! Santa must leave this for me in my stocking as I forgot to get it in Venice on my 30th wedding anniversary trip. Whenever I sew I will be transported back to Italy in my thoughts. I would love the gift set as I am going to be doing more hand quilting in the new year, and this would give me the inspiration to follow up on my plan. What a beautiful set to add to my sewing basket. Please leave in my stocking Santa. I’d love to win this set. It is so beautiful…I’d treasure it like jewelry. I need those in my stocking as I can never seem to find a pair of small scissors when I need them. OH Sweet Santa this would make a lovely addition to my quilting toys! I would love Santa to leave this pretty box and its contents for me because it is so very pretty and I love little scissors and little tapes. It wold make me smile. What a lovely set, it would go perfect with my hand crank sewing machine, which I do use! Please please please pick me. I’d wear these as jewelry..they are so beautiful. I need Santa to leave this in my stocking because it would look so nice sitting beside me while I work on my hand quilting. I’d love that from Santa because I’ve always wanted pretty embroidery scissors. Since I was a little girl. I would feel like a princess if Santa left these in my stocking. They are beautiful! Santa Baby, I really need this set to bring me so much joy while I sew for my little boys, so please Santa Baby, bring it down the chimney to me…. This set reminds me of my Grandmother and I would love to have this in my stocking. Confession time…..yes….maybe I did buy too much fabric this year and probably do deserve a lump of coal!! But how about some inspiration to give a girl a great reason to try harder to be good in 2013. This set is so beautiful, you almost want to put it on display for everyone to see, even the non-quilters that come to visit. Such a beautiful set, what a treat it would be to use. Thanks for a great giveaway~! This is a beautiful set and I would love Santa to leave this in my stocking… I have been trying to be good honest!!!! Thanks for the chance to win a little nostalgic set. kind of like my nan had..
Wow! 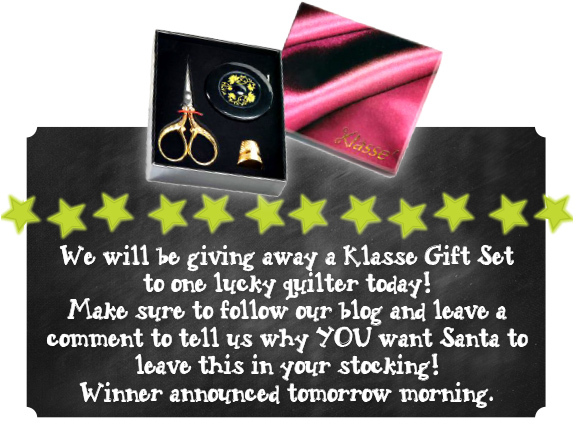 Santa, I love the Klasse’ gift set! I could clip thread, measure and avoid poking my fingers! The klasse gift set would be better than the box of candies setting next to my my sewing machine. Thank You Mod, Klasse’,and Santa !! These are so beautiful! I would love them in my stocking because I do take such pleasure in beautiful things. It would make sewing even more enjoyable. Kind of like drinking pretty much anything from a pretty glass. I need this in my stocking in order to get some handwork done. lovely, would love to win this beautiful set!! So pretty and functional,a small pair of scissors is on my Christmas list already! I’d love to have this in my stocking! I don’t have a reason why except that it’s so pretty! Santa should leave this in my stocking because I only have one small scissors and I have to remember to add it to my bag every time I take my stitching on the road. How lovely it would be to receive this set in my stocking. I do not have anything remotely as nice as this – please Santa I will need this! thank you!